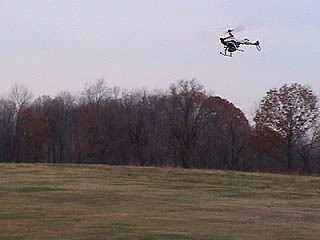 This page presents the latest flight tests of a new linear robust controller for the Carnegie Mellon University Yamaha R-50 Robotic Helicopter. I have designed the controller using a high-order linear model of the R-50 extracted at hover from MOSCA (MOdelling for Flight Simulation and Control Analysis) small-scale helicopter non-linear simulation model. Before flying, the controller went through extensive non-linear flight simulation tests. The highly accurate simulation provided by MOSCA allowed to achieve the results presented here, after only 2 preliminary flight tests of 20 minutes each. 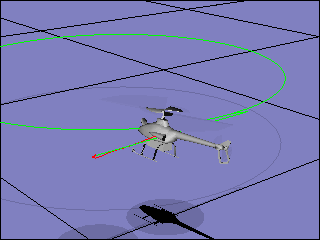 The maneuvers were all flown with the hover controller. This controller consists of 1 multivariable (MIMO) inner loop for stabilization and 4 separate (SISO) guidance loops for velocity and position control. For every maneuver there is a description and 2 different videos. The first video is from a Mini-DV camera. The second is a playback of the flight data recorded during the same maneuver; that is, it is not a simulation. The animation in the second video is created with an inteface designed to read and playback flight data for better analysis. 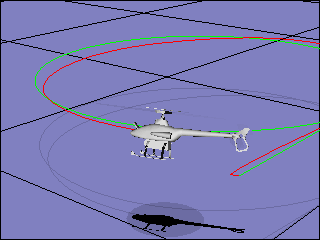 The graphical inteface also shows the desired trajectory. For the square maneuver there is only the animation video. All flight tests were performed November 7, 2001, at latitude 40.8417 north and longitude 80.1116 west; west wind gusts of 4-7 m/s were present. To see the videos you need QuickTime 5. 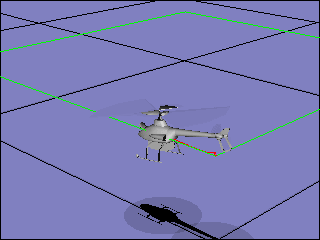 The helicopter starts from hover and tries to mantain constant altitude and yaw angle while executing 4 horizontal steps of 20.0 m: (1) 20.0 m forward (positive x step), (2) 20.0 m to the right (positive y step), (3) 20.0 m backward (x negative step), (4) 20.0 m to the left (y negative step). The ending point of the trajectory coincides with the starting one. The helicopter starts at hover. Then it accelerates forward up to to a velocity of 6 m/s trying to stay on a straight line till the turn is commanded. The turn trajectory is a circle of 10 m radius. 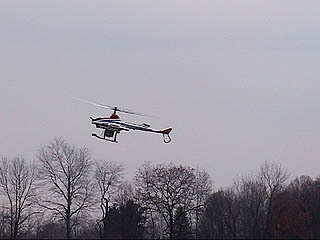 The helicopter flies the turn mantaining 6 m/s velocity and constant altitude. The helicopter starts at hover. Then it accelerates backward up to to a velocity of 5 m/s trying to stay on a straight line till the turn is commanded. The turn trajectory is a circle of 10 m radius. 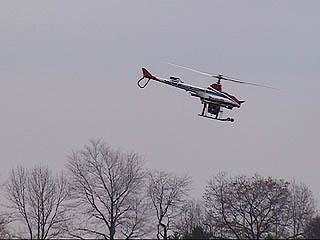 The helicopter flies the turn mantaining 5 m/s velocity and constant altitude. The helicopter starts at hover. Then it accelerates laterally up to to a velocity of 4 m/s trying to stay on a straight line till the turn is commanded. The turn trajectory is a circle of 10 m radius. The helicopter flies the turn mantaining 4 m/s velocity and constant altitude. 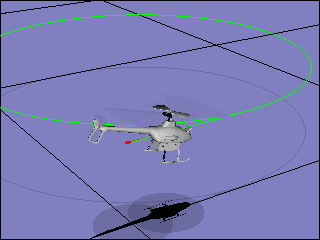 The helicopter's tail points always towards the center of the circle. The helicopter starts at hover. Then it accelerates laterally up to to a velocity of 4 m/s trying to stay on a straight line till the turn is commanded. The turn trajectory is a circle of 10 m radius. The helicopter flies the turn mantaining 4 m/s velocity and constant altitude. 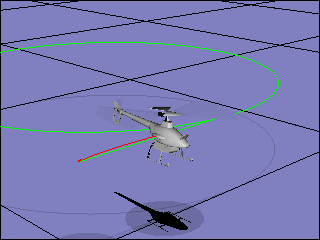 The helicopter's nose points always towards the center of the circle.